Kuhn Rikon is a very well-known global brand in pressure kitchen ware space. It is rated as one of the top Swiss brands in cookware and this ranking comes on the back of some of the best value and quality products that they have to offer. Each pressure cooker comes with some unique design that either makes it cost effective, or more efficient in cooking. One of the top series of models on offer from Kuhn Rikon is the Duromatic pressure cookers. Like all cookers, this one incorporates most of the features and benefits of pressure cooking. So you can cook food much faster than traditional techniques, and use less energy too. Thus it is a quick and ecofriendly way of cooking your food. It is also a very healthy way of cooking, because pressure cooking helps retain most of the nutrients in the food. One important aspect of the Duromatic cookers is their safety feature. These cookers come with Kuhn Rikon’s five way safety system. There is an integrated lid locking mechanism which ensures that the lid cannot be opened unless the pressure inside is reduced to normal pressure. There are around five back up features that ensure that pressure build up within the cooker never reaches dangerous levels. There is a pressure indicator that shows the pressure levels inside. This is a great way to decide how much longer you need to cook your food. The best Kuhn Rikon product in the Duromatic range is the Duromatic Duo Set. 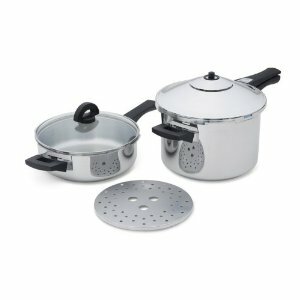 This is a six piece set with a 5.25 pressure cooker and 2 quart frying pan pressure cooker, glass and stainless steel lids that fit on both the cookers, and stainless steel steam trivet. Both the cooker and the pan are made from 18/10 high grade stainless steel which is non-reactive and ideal for all kinds of foods. It is also dishwasher safe, so you can clean them with ease. The pressure lids used for pressure cooking while the glass lids can be used whenever you want to monitor the progress of the food being cooked. The Duromatic cookers come with a triple layer sturdy base. There is an aluminum base placed between two layers of stainless steel. This allows for quick heating, uniform heat distribution, rapid cooking and is ideal for browning. These cookers come with the five-fold safety feature that is typical in Duromatic cookers. The entire operation is quite user friendly; there are inner fill lines that help to adjust amount of water for cooking different kind of foods. With a 10 year warranty on the products, you really need not worry about the quality of these cookers. You also get a complimentary cookbook, which has many interesting foods that can be pressure cooked. 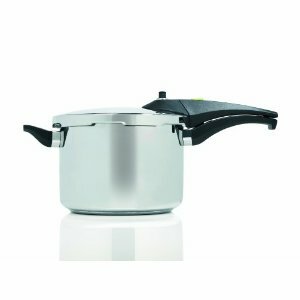 Kuhn rikon duromatic pressure cooker Review. Kuhn Rikon Stainless Steel Pressure Cooker 3344 7-3/8-Quart review. Best Buy! Kuhn Rikon Pressure Cookers At Different Size. Besides the Duromatic series, there are many other models under the Kuhn Rikon brand. If you are looking for cookers for a single adult or college student, there are the 3.7 quart cookers which are ideal for them. For a regular family, the 5 quart cookers are perfect. A larger family or a group that loves to throw parties, the 7.4 quart cookers are probably the best products to have in the kitchen. For professional cooking centers and really large family gatherings like Christmas times, the 12 quart Family stockpot is custom designed.